One of the newest sports facilities in North America, Investors Group Field opened its doors on May 26, 2013 on the grounds of the University of Manitoba campus. 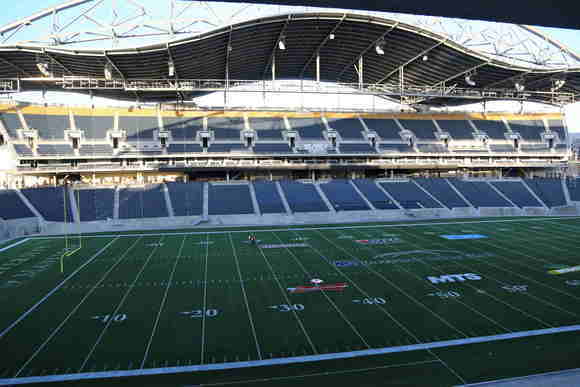 The 33,422-seat stadium is home to the Canadian Football League’s Winnipeg Blue Bombers and University of Manitoba Bisons football team, and will host games for the 2015 FIFA Women’s World Cup. When local systems contractor Advance Pro was hired for the sound system installation, Pro Audio Specialist Ted Parnell-Best, Systems Engineer Wayne Edel and Project Manager Garth Coates and team fielded a system based around HARMAN’s JBL PD Series loudspeakers and BSS Audio components. For the main loudspeaker clusters, Advance Pro installed a total of 46 JBL PD743 and PD764 co-axial mid/high-frequency loudspeakers and 32 PD7145 subwoofers. The loudspeakers and subs are suspended from the roof sections in clusters of 4-6 at regular intervals around the stadium. Advance Pro retained Signal Hill, California-based company Adaptive Technologies’ ATM Fly-Ware division to design the rigging, having worked with ATM on several past projects involving custom hardware for JBL loudspeakers. Parnell and team chose the JBL PD700 Series “because the PD Series loudspeakers have greater directivity with less interactivity between the loudspeakers than a line array system.” The PD743 and PD764 provide 40 x 30-degree and 60 x 40-degree coverage, respectively, and can be mounted horizontally or vertically. The loudspeakers are designed to deliver high-impact sound at throw distances that are beyond the range of traditional single-driver designs and Parnell pointed out that “the PD system is easy to listen to even at high SPL, and seat-to-seat coverage is extremely consistent.” Every PD Series loudspeaker enclosure is treated with JBL’s WRX extreme weather protection. More than 1,200 additional JBL Control® Series loudspeakers are located throughout the stadium. Eighty Control 25AV and 52 Control 29AV loudspeakers provide fill sound for the upper and lower suite levels, respectively. Six hundred thirty-five Control 25T and eight Control 29AV indoor/outdoor models and 573 Control 26CT in-ceiling speakers are placed the concourses and Back of House at Investors Group Field to ensure everyone in the stadium enjoys clear, articulate sound. Signal processing for the system is provided by BSS Audio. Wayne Edel noted, “BSS Audio has a long history of successful installations in sports venues and we’ve used BSS Audio products on a host of projects in the past. The amount of DSP horsepower BSS Audio Soundweb London components provide is second to none and there’s never an issue with latency.” The Investors Group Field system includes two Soundweb London BLU-800 processors, eight BLU-320 input/output expanders, four BLU-BIB input expanders, and four BLUCARD-IN and 44 BLUCARD-OUT input and output cards. The BSS Audio components, JBL loudspeakers and the bevy of Crown amplifiers used in the system are networked using HARMAN’s System Architect configuration, control and monitoring software. Fifty-eight Crown CTs Series CTs 2000LITE amplifiers, Thirty-two Crown MAi9000 amplifiers and three CTs 4200USPCN amps are installed in the system.